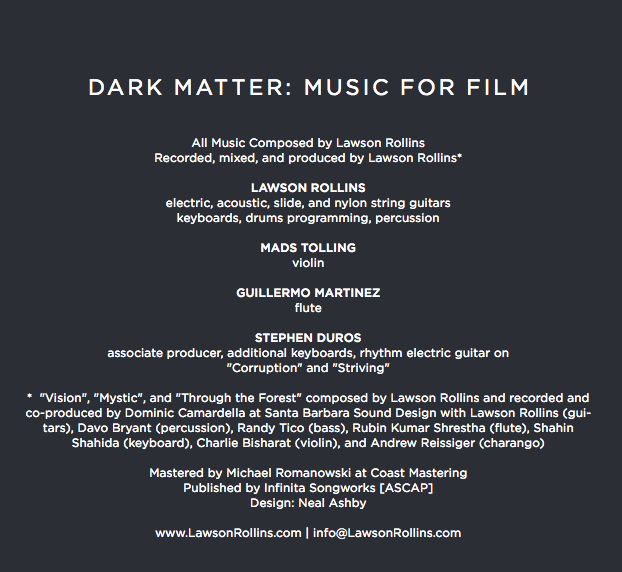 DARK MATTER: MUSIC FOR FILM marks a bold departure for Lawson Rollins as he sets aside his main instrument - the nylon string Spanish guitar - and crafts a mysterious soundscape of lush steel string acoustic and electric guitars, synthesizers, violins, and flute that transcends conventional song structure in favor of free-form musical impressionism ripe with emotional intensity. Physicists have postulated the existence of a hypothetical, unseen ‘dark matter’ that pervades the universe and comprises possibly 85% of the mass of the universe, yet this dark matter can’t be measured or defined. With this album, Lawson has endeavored to strip away his main musical tool - the nylon string guitar he is known for - and explore the musical dark matter that lies beneath his signature guitar work displayed on his many albums over the past 20 years. 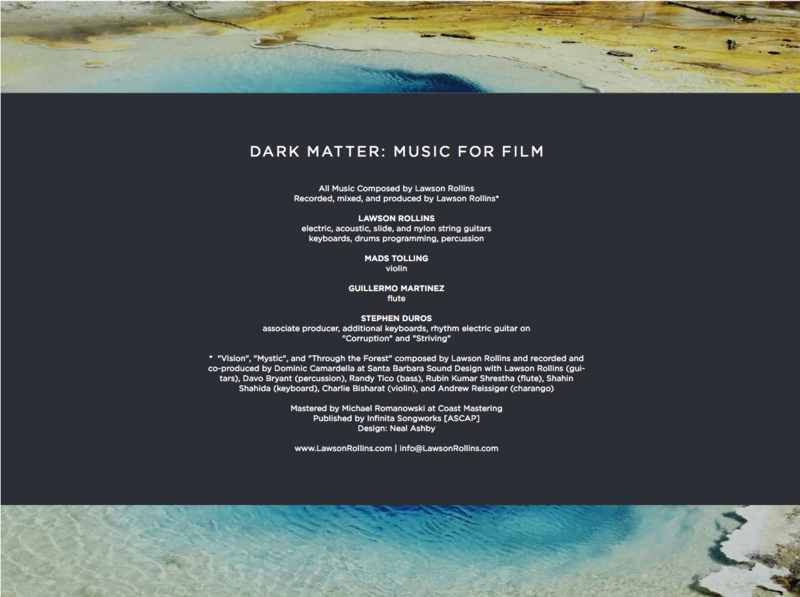 The atmospheric instrumental music on DARK MATTER: MUSIC FOR FILM offers a cinematic, impressionistic sound that is designed to serve as the soundtrack for the Listener's imagination. Listen out for tracks from DARK MATTER on Sirius-XM’s ambient channel. Also heard on 120 NPR stations nationwide on the syndicated Echoes program. The album is in the Top 15 on the ZoneMusicReporter Top 100 radio chart. Chart is here.